Throughout the world there are many, varied and curious ways of disposing of the dead. In the mountains of Abyssinia is a people who believe a man should be buried where he dies without pomp or ceremony; neither should the remains be moved from the exact site of death one foot more than is necessary. This practice is thousands of miles away; let us come to our own country, and in New Orleans we find another queer, unique mode of burial. In order to more clearly understand this mode of burial, we should first know something of her cemeteries, which are more than thirty in number. 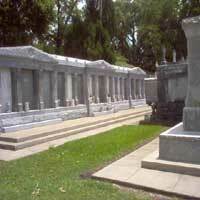 New Orleans has the country’s oldest cemetery, (St. Louis No. 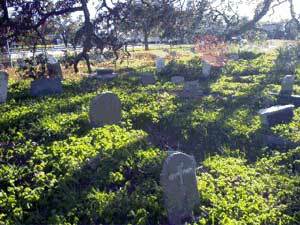 1), with an area of about one and one-half acres and an estimated ninety thousand burials, all above ground. It is correctly called “A City of the Dead,” and is still used today. This unique way of interment was not by choice but by necessity. In the days before artificial drainage the water table was within a foot of the surface, therefore a standard grave was out of the question. The problem was solved with the present system – a cross between the catacombs of Rome and a mode used by the inhabitants of the lowlands along the Northern Mediterranean Sea. 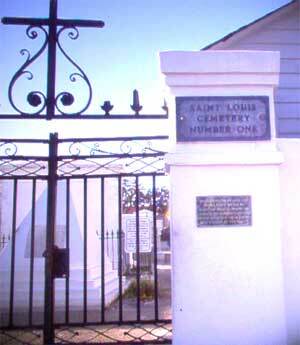 Of all New Orleans’ cemeteries, St. Louis No. 1, due to age and quaintness, is the most interesting. It has one entrance, facing east, so small a casket has to be carried, or wheeled in. The streets, lanes or passageways between the vaults are paved with shell, they are narrow and none too straight and often blind, with an occasional pomegranate or magnolia tree. Most of the vaults have two and four compartments, called crypts or ovens. They are privately owned and as a rule, kept in a fair state of repair. Others, from the lack of proper foundations, have sunk practically beneath the surface, some have sunk on one side so fat they could easily be toppled over. Then there are the large vaults, having twenty-four to thirty compartments. These are erected by societies of the city. The fence or wall which encloses the cemetery forms what is called the wall vaults and in these are buried the poorer classes. The wall vaults are four compartments high, and are erected, sold and rented by the church. Many of these compartments have a small balcony the length of the opening, approximately thirty inches. On these balconies are placed flower pots, vases and small pieces of marble, usually with only one word inscribed: Mother, Father, Wife, Sister or Brother. Those which do not have balconies may have a wooden shelf. Some have neither, their only ornament a home-made tin flower pot which looks like a funnel cut in half. In the cracks and on top of the vaults where dust has settled grows a species of fern and occasionally a species of narcissus, the Star of Bethlehem. As to how one is buried, let us follow the sexton as he prepares a vault for use. Into a wheelbarrow he places a shovel, rake and a heavy hammer with a short handle. If it is a top vault he places the wheelbarrow in front of it and stands in it. In the event the vault has not been opened for a score or more years, he hesitates, thinks, wonders, and, who knows? There may be buried treasure. Then, with gentle blows he loosens the bricks and takes them out one by one, pausing to clean each, as they are to be used again to seal the vault. 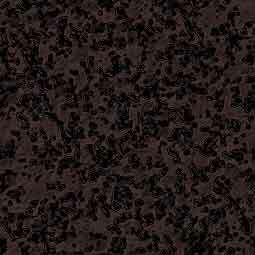 The moving of the first brick lets in the light and suddenly a buzzing sound is heard which is followed by an exodus of bright bronze-colored roaches. Occasionally there is a quite a commotion within the vault. This is caused by a rat running over loose bones and usually making its escape, as the sexton is by this time busily fighting roaches of his person. Holding his nose and shading his eyes, the sexton peers into the vault and looks at the future as far as it is possible. What he sees he will never forget. The interiors of the vaults are not always the same. 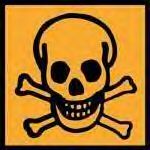 If the vault has not been opened in many years, the casket will have fallen in decay, leaving the skeleton intact lying flat on the vault floor. 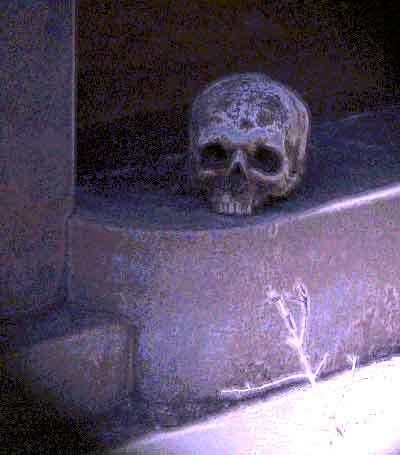 Amid the casket’s remains occasionally a skeleton has been found face down, indicating some one had been buried alive, which was not unusual years ago. The people had such a horror of this that it was customary to place a bell in the hand of the corpse. The sexton draws the skull to him with the rake and smiles or shakes his head, for at one time medical students paid ten dollars for a good skull; then, too, some people filled their teeth with gold. He searches the vault and with the rake pushes the remains back into a corner, where, as a rule, is a small, neat pile of bones. The next vault opened may have been used in the last two or three years. In this instance, the greeting is different, for the casket is found in good shape if not too cheap. The sexton then takes his time removing the cover. This accomplished, the casket is turned upside down so the remains may fall out. When the roach episode, which lasts about two minutes, is over, the casket is placed in the sun to dry. The vault is then searched and the bones pushed back into the corner. It is in instances of this kind that one can see that the hair, toe and finger nails grow after death. When the sexton opens a vault and finds the casket in such condition that it has no value, it is burned. 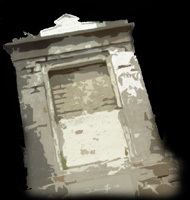 The remains in a rented vault, when the rent has not been paid, are taken out and buried. A vault can be purchased, or rented for a year and a day. According to law this much time must elapse before the vault can be opened. By this time there is nothing left to a body but bones. As many as thirty-odd people have been buried in the same vault or crypt. Should two members of a family die within a year, a vault is rented for a year and a day for the second member and after that time the remains can be transferred to the family vault. This is done to save rent for many Orleanians, like other people, believe it is cheaper to move than to pay rent. In most of the city’s cemeteries the line of creed or color is not drawn, Jew, Catholic, Mason, Protestant, white and black are buried side by side. This mode of burial applies to rich and poor alike. There are, of course, some exceptions, but the majority of the people of New Orleans believe this is the proper way to inter their dead. 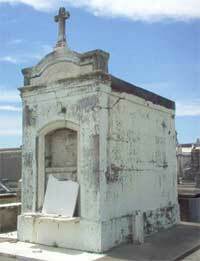 Suggested Links to find out more about Haunted New Orleans St. Louis Cemetery Number 1, Haunted New Orleans history, Cemetery Tours. 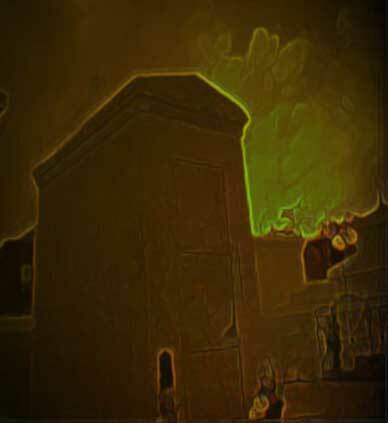 This is not a great New Orleans neighborhood, it is very dangerous and down right scary to visit this cemetery alone or without new Orleans licensed CEMETERY TOUR GUIDE: enter at your own risk.